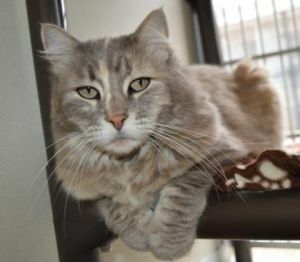 Lucy will have been looking for a home for 972 days on Saturday, August 18th. August 13, 2018 – Imagine rows of empty kennels and peaceful quiet at the Santa Barbara Humane Society. This could be reality after August 18, 2108, when the Santa Barbara Humane Society will offer free adoption for all cats and dogs. This special event marks the SB Humane Society’s participation in the annual national “Clear the Shelters” drive. The SB Humane Society is open from 10 am to 5 pm on Saturday, August 18. Other Santa Barbara County animal welfare organizations, including the Santa Maria Valley Humane Society, ASAP, and County Animal Services are also participants in the drive. Over 900 shelters throughout the United States are participating in “Clear the Shelters,” an initiative by Hills Pet Nutrition, NBC and Telemundo to find forever homes for homeless animals. Since 2015, more than 150,000 pets have found loving, forever homes during this promotion. The Santa Barbara Humane Society has dogs and cats of all ages and sizes that are waiting for their forever homes. Adopters must still meet the usual adoption requirements. Adoption prices are normally $60 for cats, $120 for kittens, $80 for dogs, and $160 for puppies. All adoption animals are spayed or neutered, up-to-date on vaccinations, and microchipped. Donations are appreciated since the Santa Barbara Humane Society is an independent, local non-profit organization which is not affiliated with the Humane Society of the United States. Stella and her teddy bear will have been looking for a home together for 178 days on Saturday, August 18th. Brooke will have been looking for a home for 835 days on Saturday, August 18th. Sweetie will have been searching for a home for 504 days on Saturday, August 18th. Jasper will have been looking for a home for 398 days on Saturday, August 18th. Everyone loves an adorable kitten; that’s a no brainer! But right now we have so many well-tempered and truly beautiful–honestly gorgeous– other cats that are seeking their forever homes. Please think about giving them a look, too!